Enemies: Alpha Flight, Cap, Charmer, Colossus, Comet Man, Cyclops/Mr. S, Daredevil, Doc Samson, Dogface, Domino, Double Header, Enforcers, Feral, 4-D Man, Alicia Grimm, Howard the Duck, Hulk, Hydra, Iron Avengers, Iron Maiden, Iron Man, Jack of Hearts, Jade Dragon, Ka-Zar, King Britain, Mermaid, Norman Osborn, Omega, Redwing, Sandman, Spidey, Spiders Man, Shanna, Sunfire, Sunspot, Texas Jack, Thanos, The Thing, Tower, Union Jacks, Venom, Vision, Wizard, Woodgod (all of these refer to the EARTH X VERSIONS ONLY and not to their Earth-616 counterparts; in addition, virtually all of these were forced to serve him, so even though they fought as his side, they weren't really his allies). Powers/Abilities: The Skull had the power allowing him to take over the body functions and powers of an unlimited number of people at once and potentially the whole world. The people he controlled could not do anything at all without him making them do it, and though he was young, he exhibited excellent control of his powers. He may or may not have been able to control minds as well, but chose not to, and thus his victims knew of their plight, but could do nothing about it. Because of this ability, he had a nearly unlimited number of super powered legions at his command. There were limitations to his powers, however, in that he could not control the minds of the insane -- nor could he control beings who had no minds to control. He also had to be within a certain distance of a being to first enslave him or her. However, he could apparently maintain this control from any distance. His major shortcomings were that he was young, overconfident, and uneducated. (Earth X Sketchbook/Earth X#9 (fb)) - In the alternate reality of Earth X, the Celestials implanted an embryo deep within the core of the Earth which would eventually become a new Celestial, destroying the Earth in the process. After all humanity developed super powers, they ran the risk of destroying the planet and therefore the Celestial embryo. Thus did the Celestials activate a fail-safe: the power to take over people's minds and free will would be placed in a single individual. That way, that individual would take over the world and prevent it from being destroyed so that the embryo remained safe. 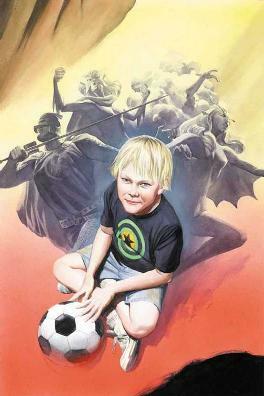 (Earth X Sketchbook) - As humanity died, the greatest and most terrible of new powers, the ability to make anyone do anything you wished, was placed in the hands of a young boy -- a child who might not have become so embittered, insolent, and insecure were he not given his ultimate ability to be an overman. This individual was Benny Beckley, son of the Comet Man (Stephen Beckley). He would call himself the Skull. (Earth X#5,6,7, Paradise X#1) - At the moment of Benny Beckley's mutant awakening, his telepathic "birth" unleashed a wave of psychic backlash that killed all the world's telepaths, including Professor X (Charles Xavier), White Queen (Emma Frost), and M.O.D.O.K. (George Tarleton). (Earth X#7, Earth X#1/2 (fb)) - After the Skull's powers first manifested, his parents asked him to meet with Doc Samson (Leonard Samson) for psychiatric help. He used his mental powers to force Samson to kill himself by pulling himself inside out. He also killed his aunt Rosemary. After that, a Nick Fury LMD (life model decoy) started tracking him. (Earth X#3 (fb) - BTS) - The Skull took control of very large groups of people in California, continuously expanding until he had hundreds enthralled by his power. 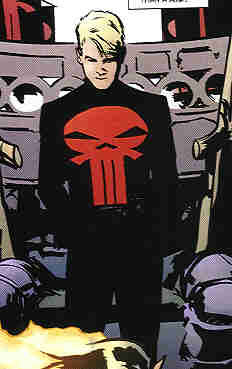 (Earth X Sketchbook) - He began using a red version of the Punisher's skull symbol -- representing his control over all skulls and granting seemingly eternal life to the original Red Skull's Nazi presence. (Earth X#3 (fb) - BTS) - The Skull converted the deceased M.O.D.O.K. 's hover chair into his throne. (Universe X: Beasts (fb) - BTS) - At some point, the Skull ate Howard the Duck (due to the worldwide food shortages; see comments). (Earth X#3, appendix) - Skull took control of several heroes/villains including Domino, Sunspot (Robert Da Costa), Feral (Maria Callasantos), Omega, the Jade Dragon, the Iron Maiden (Karen), the Sandman (William Baker), the Jack of Hearts (Jack Hart), Texas Jack (Jack Muldoon), and the Wizard. (Earth X#3 (fb) - BTS) - The Skull started having his massive legions store supplies and food for the trip from California to New York. He planned to march across the country and take control of the whole thing. Once he arrived in New York, he wanted to kill President Osborn to take all the power himself. (Earth X#2 (bts)) - Some of the super powered people under the Skull's control attacked a circus where Daredevil of Earth X was doing an act. (Earth X#3) - The Skull continued to have the people under his control collect supplies. Namor then came out of the sea and attacked to prevent them from using thousands of fish as their food for the journey to New York. The Skull sent Iron Maiden and many others in his service to fight Namor. Though Namor defeated them, the Skull then took control of Namor himself and forced Namor to bow before him. Cap (Steve Rogers), who was watching from a distance, was shocked to see that the Skull was nothing more than a kid. (Earth X#4) - Cap and Redwing (Wyatt Wingfoot), in search of evidence to substantiate Cap's claim that the Red Skull returned, confronted the Skull in California. Cap told him to relinquish control of the people there, but the Skull refused, saying that America and everyone in it was his. He then forced Spiders Man to trap Cap in an illusion of his own greatest fear (including images of his old partner, Bucky, and of the Skull as Bucky). Skull then took control of Redwing and forced him to attack Cap along with dozens of others. Cap retreated under a barrage of rocks, but the Skull allowed him to retain his motor functions, just to increase his suffering. (Earth X#5) - The Skull had his controlled troops make final preparations for the march to New York. He also expressed shock that anyone would even want to be free from his control. (Earth X#6) - The Skull marched through the country, enslaving anybody who came within his vicinity. His legions grew larger continuously. Devouring the individuality of the new Superhuman America, the Skull moved across the nation, drawing everyone he encountered into the uniformity of his Reich. His empire built upon their plundered minds, a new master race with one Master. One nation under a prepubescent god. (Earth X#7) - The Skull's forces completed their march and stood right outside New York City. By this time, he had enslaved tens of thousands of people. (Earth X#8) - The Skull arrived in New York City with his army. He had them attack the genetic Hydra construct because it grossed him out. Skull was then confronted by the NYPD. He proceeded to make them all kill each other, and enjoyed himself very much. Later, Venom (May Parker) attacked and he took control of her as well. Then, along with a few of his top officers, the Skull confronted President Osborn in his office. (Earth X#9) - The Skull took control of Norman Osborn's Enforcers and then pushed Norman Osborn out his office window. Osborn caught his leg on a hanging flag and the whiplash broke his neck, killing him. But the Skull wanted Osborn to splatter on the ground, so he ordered his minions to retrieve Osborn's body so that they could throw him out the window again. The Skull then appeared on every channel on every television and announced that President Osborn was dead and he was now in charge. (Earth X#10) - The Skull lost control of the Wizard, whom had gone completely insane as a result of being crippled. He forced Texas Jack to kill the Wizard. After Iron Maiden insulted him, Skull forced her to fall and then berated her, telling her that he was God. As soon as he had he finished yelling at Iron Maiden, Cap along with dozens and dozens of heroes whose help he enlisted attacked the Skull's army. To prove a point, the Skull refused to make his troops fight back until Iron Maiden apologized. She did so, and he ordered his legions to attack the legions of heroes. He proceeded to take control of and enslave most of Cap's army with no difficulty. (Earth X#11) - The Skull was in control and declared the planet his. However, Alicia Masters created and animated several clay statues of heroes and sent them to battle the Skull. Since they did not have minds, the Skull could not control them and ordered his legions to fight against them. As the battle raged on, Cap, who was himself covered in clay, thereby creating the illusion that the Skull couldn't control him, snuck up from behind the Skull and killed him by breaking his neck. (Earth X#12-appendix) - Captain America buried the Skull where he fell, using his shield, as the Celestials landed and passed judgment on Earth. As he didn't know the boy's name, Cap called the Skull "James," as he "doesn't believe in unknown soldiers." Cap also noted that "those familiar with my history would be horrified if I referred to you as James." (Paradise X#3) - Approximately four years later, Cap, who had been killed and now served as a member of the Avenging Host within Mar-Vell's Paradise, was charged with the duty of protecting Paradise and transporting souls to Paradise from the Realm of the Dead. But Cap was faced with a problem: many inhabitants of the Realm of the Dead could not be persuaded to make the journey to Paradise. After giving the problem some thought, Cap formulated a plan that he thought would get everyone from the Realm of the Dead to Paradise. He figured that the Skull still existed in the Realm of the Dead and that his awesome mind-control powers could be used to move all of the souls to Paradise. Cap traveled to the Realm of the Dead with the intent to contact the Skull's soul. (Paradise X#5) - Cap arrived at the Beckley household within the Realm of the Dead and explained his plans to Stephen Beckley, the Skull's father and formerly the hero known as Comet Man. Stephen Beckley explained that the government gave Benny his powers and that he did not want Cap around, fearing that his presence may reawaken Benny's mind-control powers. (Paradise X#8) - In the Realm of the Dead, Thanos confronted Cap and accused him of planning to use the Skull's powers to force everyone to commit mass suicide to allow them to enter Paradise. Thanos wanted to remain in the Realm of the Dead. Their argument was interrupted by the 4-D Man (Kyle Richmond). (Paradise X#9) - Cap, Thanos, and the 4-D Man appeared before Stephen and Benny Beckley in the Realm of the Dead. Cap revealed Benny's past as the Skull, causing all of this memories to come rushing back and driving him into a homicidal rage. The Skull forced his father to decapitate himself, and then used his powers to control Cap, Thanos, and the 4-D Man. Thanos and the 4-D were forced to salute the Skull as Cap involuntarily bowed before him. (Paradise X#10) - Comet Man (who could not be killed since he was already dead) became aware of his "death" at the hands of his son and convinced the Skull to aid Cap in his quest to transport souls from the Realm of the Dead to Paradise. (Paradise X#11) As Reed Richards entered into Paradise via his portal into the Negative Zone, those within Paradise prepared themselves to rebel against Mar-vell's rule. The Skull is seen on Comet Man's shoulders as the Avenging Host talk amongst themselves. (Paradise X#A) The "rebellion in heaven" flounders, as the gathered heroes cannot find Mar-vell. Suddenly, Mar-vell reveals himself by eclipsing the sun; the Skull attempts to control Mar-vell using his powers. Upon failing, the Skull learns from Thanos that Mar-vell cannot be controlled since the Kree do not have Celestial seeds planted within them. Later, the Skull is seen when the Kree arrive to claim Paradise as their colony. (Paradise X#X) The Skull is seen with Comet Man after the battle for Paradise ends and Reed Richards inherits Mar-vell's power. The Skull may or may not have been enemies with his Earth-616 counter-part's enemies. Same goes for affiliations. Same goes for relatives to a certain extent. see Ben Beckley's profile in the clarifications. In fact, while Krueger may have leaked the info on the Skull's identity before, I don't think he was revealed to be Ben Beckley until the Paradise X series, when Cap visited him in the afterlife. As Omar Karindu points out, "if leaks were canon, Adam-X would be the third Summers and Mr. Sinister would be the ectoplasmic body of an evil mutant orphan child." Here was Jim Krueger's plan for Howard in his original EARTH X proposal: "HOWARD THE DUCK- Becomes a feast at the Skull's celebration of claiming New York as his own." But a few of Krueger's plans from his original proposals didn't make the transition to the final script. I guess the scene with Howard got cut because of space constraints. But then, in UNIVERSE X: BEASTS#1, the Beast made the following revelation: "When the world population evolved, its appetites changed as well. With the exception of a few opportunists who anticipated the coming need and secretly bred and sold animal life through the underground, Wakanda was the only known nation where mammal and fowl hadn't been hunted down and consumed. I still feel badly about Howard." In a subsequent interview Krueger revealed: "Yeah. The Skull ate Howard, as hinted in the Beast Special." When a Howard fan expressed disapproval, Krueger responded: "You know, you really shouldn't get angry. I mean, It's Howards own fault. It's the cigars that killed him, really. After all, who can resist smoked duck?" I'd be interested to hear Gerber's take on this. He may find it quite funny...or just the opposite--Snood. As amazing as it is, Skullogeist sent me the info regarding Paradise X while never having actually read Paradise X (I wish I could have gleaned the character info without reading that series (or its 5 million spin-offs)!--Snood). If he missed anything, which he says he may have, please let us know, and it will be added. Thanks also to Dr. Worm for adding the info about the Skull's burial and his appearances in the realm of Death.